For that outdoor cycling feel, the Bladez Master GS Bike delivers with a near-silent drive belt and large 44-lb flywheel to give you the experience similar to a true road bike. This indoor cycle features a performance monitor that shows time, RPM, speed, distance, and calories. The display is lights up once you start to pedal and will switch off if the unit is idle for more than four minutes. The monitor uses 2 AAA Alkaline batteries. 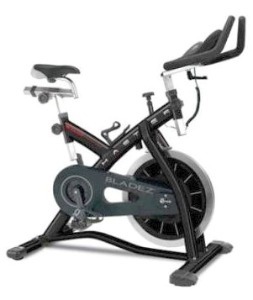 The Bladez Master exercise bike has a large 40-lb flywheel, a quiet belt drive, an oversized steel frame, racing style handlebars, transport wheels, and a water bottle holder. Resistance is adjusted via the brake knob. The anatomically cut-out designed saddle adjusts for/aft, and up/down, plus you can switch out the saddle, pedals, and handlebars to customize the Bladez Master. The usual information found online suggests this exercise bike has a max user weight of 300 lbs, but the manual indicates the user weight should be no more than 265 lbs. The Bladez Master comes mostly assembled, and will require about 30 minutes to put the bike on the stabilizer frame, and attach the seat, pedals, and handlebars. Reviews on this model indicate users are satisfied with their purchase. The usual price on the Bladez Master Bike is $999 but occasionally we have seen it online on sale as low as $599, and at that price it is a very good buy. However, we would not recommend spending nearly $1,000 for it as there are better bikes out there in the $800 to $1000 range such as the Spinner Velo, Livestrong LS9.9IC, and Diamondback 910Ub, all priced at around $899.